Biography of Al C. Adams, Jr.
Al caught the "gold fever" (as you may know, there is no cure) at an early age in the 1960s, growing up in Gainesville, Georgia, which is only a few miles from Dahlonega, Georgia, site of America's first major gold rush, which began in 1829. He has nurtured a lifelong interest in historical preservation of the Southern gold rush history and has the understanding that coins, although very important, are only part of this fascinating story. The complete story spans 200 years and also includes: gold deposits, native americans, miners, mining companies, people, wars, governments, politics, mints, coins, and collectors. October 1997: purchased the John Jay Pittman 1833 & 1835 Proof $5 gold coins. The 1833 Proof $5 was the highest priced coin in the entire auction, weighing in at $467,500. The cost of these two coins totaled over 6.5 % of the entire auction prices realized at this landmark event! August 2012: Purcahsed the Legendary 1876-CC Liberty Half Eagle PCGS MS66 CAC for $477,520 from the Battle Born Collection of Carson City Mint Coinage. The Battle Born Collection is the finest collection of Carson City Mint coins ever assembled. Formed and Managed the first rare coin Limited Partnership Fund in Georgia. 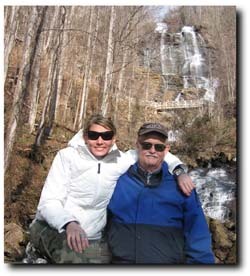 Al Adams and daughter Ashley Adams at Amicalola Falls State Park, Georgia.